Article from Periodismo Humano (Human Journalism). This is the original source. “When they ask me what we want, I say that we want to spark off an international social change; when they ask me how we are going to do that, I say that creating a new power, citizen power that pressures the other powers to spark off that change”. These are Olmo Gálvez’s words, member of Democracia Real Ya (Real Democracy Now), one of the organizations working for the multilateral, international and unified call for October 15th. “This cannot be just like any other demonstration, just like the one on May 15th wasn’t”, says Miguel, one of the first ones who camped out in Puerta del Sol square and who now tries to take the cause to the next level, through Take The Square, the movement’s international branch. There are hundreds of concentrations called for next Saturday in about 45 different countries. The biggest ones will most likely take place in the United States, Brussels and Israel, since they have already launched their own “indignant” movements in the last weeks or months and with whom it has been easier to coordinate. In other cities, the protest will probably barely gather about twenty people. “October 15th has been conceived as a global demonstration and not as a combination of local concentrations”, explains Miguel, physicist and university professor, who is barely over thirty years old. “When we began to talk with other countries the first thing we had to decide was ‘why are we protesting’. Because of the crisis, global warming, corruption? We realized that even though we all have a lot of issues in common, the priorities change a lot from one place to another”. That is why they decided to take the approach and turn it around, draw on the inclusive spirit that characterized the 15M movement on its first weeks and lay the foundations of a global movement based on three basic demands. The first one: dignity. “It’s a word we took from the Arab revolts, especially heard in Egypt, for example”, Miguel comments. Dignity against the four powers: economic, political, military and the media. These are the ones that have been listed several times during the meeting to prepare for Oct. 15th that took place this Sunday at Retiro Park in Madrid, with representatives from the different neighborhood and town assemblies and with the work groups that were formed at Puerta del Sol. 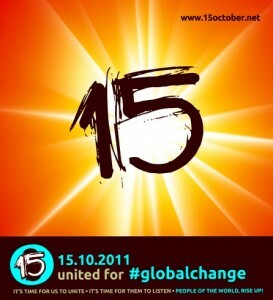 The second pillar of the social change the international version of 15O aspires to is direct democracy. “We went out on the streets because we want people to start to decide what kind of world they want to live in, instead of having it decided for us”, says Miguel. If the indignation creates a new political space it will be thanks to network technologies, but how about the assemblies that have been so characteristic of the 15M movement? “We will have a hybrid decision-making model”, predicts Olmo Gálvez, “where the assemblies will still carry their weight, but technology will get more important every day. There is a digital divide, some people don’t have access to digital tools, or don’t use them”, he clarifies, “but global change is not possible without them”. 15O’s third ambition is not a demand towards the powers but a call to proactivity: “the important thing is not October 15th, the important things are the 16th or the 17th. We are trying to spark off in several cities around the world what happened in Sol: that when the protest is over people will say… well, now what? How do we organize ourselves?”, Miguel points out. If these three lines of work are successful, “we are going to create a new social category”, says Olmo Gálvez. “Just like political parties, or trade unions, were created at a certain time in History, now we are going to create citizen pressure groups all together”, he asserts. That citizen pressure group, with no support from the institutions and understood as a combination of individualities, would act in relation to political parties or trade unions as an external collective. That, as is explained time and again in all debates about 15M, does not mean calling to abstain from voting or necessarily going against political parties. It is simply a widening of the political landscape. “Then, each one will have to decide individually how to participate or if they don’t”, says Gálvez. Writer Amador Fernández Savater described 15M as “a space more than a political entity” to “share a problem, not an identity”. People could “stop being what they want us to be” and “share what we have in common beyond the labels that divide us”, he writes in one of his many articles on the issue. However, the 15O call has the unofficial mission of regaining that spirit of inclusiveness and unity, because no one hides the feeling of deterioration anymore. “The movement has lost a lot of strength because each assembly and each work group does its own thing”, says Miguel. The fragmentation of the 15M movement has resulted, among other things, in an impossible-to-follow schedule of street protests in the last few months, with weeks in which there were up to four or five concentrations called by different work groups and assemblies. “That kills the movement”, says Miguel, “because we are all worried about the issues of these demonstrations, but going out on the street three times a week is not going to change the world”. In his opinion, the campaign to stop evictions “is a good example of the strength we can achieve of we all work together”. Sol is a symbol full of nostalgia, unique but exportable. 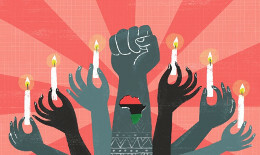 That is why rays of light subtly shine from the back of the poster that represents the October 15th mobilization. In the many forums that have been set up to coordinate and encourage participation in the event it is easy to come across references to “the lessons from Madrid”, for example in the text that shapes the movement in English, where a consensus is reached that “Madrid has taught us that the intention is not to create a hippie commune, but working networks among all of us to start off something new” and that the goal is to “know how to organize ourselves the day after” based on the values of “non-violence, respect, deep and non-dogmatic listening”. Far from Madrid, geographically but not ideologically, is Victor. Victor’s name is not Victor, it is a Westernized name he uses as a nickname to facilitate communication with other people. Victor is Chinese, lives in the province of Nanning, is 24 years old and works in an industrial production public school. He takes part, not completely free of risk (“well, they don’t have enough energy to monitor every conversation”), in the forums that coordinate 15O through IRC chat networks. His dream is “that global change reaches China, the Chinese people. That we can be free in a world with no countries”, he tells us privately. Victor will try to “meet with a group of friends on the street on 15O, but we can’t draw a lot of attention or be there for long because the police could arrest us”, he says. In Bordeaux, Philippe gets ready to go to one of the protests organized in this French city. “Yes, there are several demonstrations. You know that French people have trouble concentrating on just one thing”, he says ironically. “What happened in Spain has been an inspiration for a lot of people and I hope that that will grow, although I don’t think 15O will be very big in France”. Philippe focuses his demands on getting the French to understand that “it’s very dangerous to listen to right-wing fanatics to solve problems”, something that “happens more and more every time”, in his opinion. For him, the common ground for a global change has to be taking action against “the dictatorship of big business”. Another tiny spot in the 15O map will be the Russian city of Samara, where Alexey will attend a “small concentration”. He tells us that he will try to compensate for it setting up “something bigger and more interesting” in Moscow. “We are organized in local networks and we act in a Do It Yourself mode”. The 15M movement organizes once more in Madrid a protest with more than one head. Several “columns” will depart from different neighborhoods, will meet each other along the way and flow this time first into Cibeles square at 18h, and finally into Sol. There a moment that is in the indignant’s catalog of emotions since June 19th: the live interpretation of Beethoven’s Ninth Symphony. “We know it is the anthem of the European Union, but we identify it with a sense of humanity”, the Action commission explained this Saturday in Retiro Park. The operational challenge is as big as the ideological ambition: schedules, loading and unloading, PA system, screens to see what happens in other countries, in some cases with a time difference. “It could be a very long night”, they warn, if people want to stay to see what happens in New York or Washington, for example, where there is a six-hour time difference. If a sense of euphoria comes from there and the night in Sol goes along without incidents, it is very likely that some group decides to spend the night in the square, although no one mentions the word “camp”.